My last post included a photograph of a 1940s military recruiting booth on the Fordham Road overpass at the Grand Concourse in the Bronx. Portrayed above, another wonderful oddity of Bronx architecture: Public School 11, originally Grammar School No.91, in the Highbridge section of the borough. The core structure of the school, designed by George W. Debevoise, was built in 1889. A portion of a 1905 addition, designed by C.B.J. Snyder.the most prolific of the New York City public school system’s superintendents of building, is visible at the far left of the photo. New York City’s public schools — or their facades at least — were designed to conjure up ennobling palaces of education in which all pupils could feel equal, and as deliberate contrasts to the often substandard housing from which most pupils came. 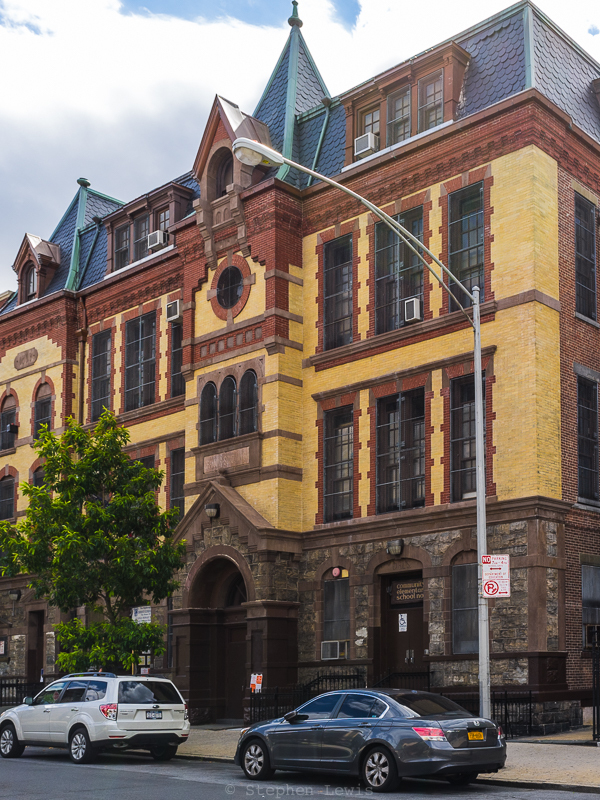 Public School 11 is a rare example of a New York City school with a facade inspired by Romanesque Revival, a style that, in the city’s massive school building program, was soon surpassed by Neo-Gothic and later, by Neo-Classicism, Art Deco, and Modernism. For an introduction to the architecture of New York City’s public schools, click on the website of the NYC Department of Education. And, if you went to public school in New York in decades past, feel free to join me in singing a chorus or two of “East Side, West Side”!